The brand new and second album from Angelmark is now available! Michael Turner's latest solo project under the Angelmark moniker is titled "Uncertain Futures And Fading Pasts". The album features eight songs and once again sleeve art is courtesy of Lam Wong at Design + Format. You can find the CD at various online stores including Tonevendor in the US, Ping Things in Canada and Norman Records in the UK. There are also a few indie record stores offering "Uncertain Futures And Fading Pasts" but ordering online is your best option. Well, the fantastic compilation from Words On Music that features Titania's Wire cover version is now available at all good stores and via mail order. "A Houseguest's Wish: Translations of Wire's Outdoor Miner" is Words On Music's 25th anniversary tribute to the seminal Wire song "Outdoor Miner." Other bands included are featured include Adam Franklin (ex-Swervedriver), Fiel Garvie, Lush, The Meeting Places and Junetile plus a bunch of others too. The online zine Somewhere Cold has posted a nice interview with both Michael and Mandy. Read it here. 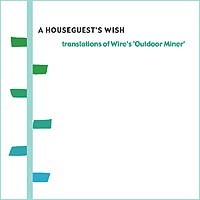 "A Houseguest's Wish: Translations of Wire's Outdoor Miner" will be released by Words On Music on November 9, 2004. The album is available for pre-order now exclusively through Words On Music with an estimated ship date of October 5, 2004. Titania are one of two Canadian bands contributing to the project. Check out the Words On Music site for an MP3 sample of Titania's "Outdoor Miner" cover then pre-order the CD today! "A Houseguest's Wish" is Words On Music's 25th anniversary tribute to the seminal Wire song "Outdoor Miner." Released in 1979 as a 7" single (and appearing in a more skeletal version on their "Chairs Missing" LP), fans and critics have long regarded "Outdoor Miner" as one of Wire's finest moments - and one of their rare early excursions into unbridled, sugar coated pop. Words On Music has assembled interpretations by 19 artists from five countries (Germany, Spain, United Kingdom, Canada, USA) into one stunning and diverse collection ­ translating the song into versions ranging from folk to punk. Some of the bands featured include Adam Franklin (ex-Swervedriver), Fiel Garvie, Lush, The Meeting Places and Junetile - among many others. In addition to the two new self-titled albums from Titania and Angelmark, the good folks at toneVENDOR are now offering the two earlier CDs from Titania when they were known as The Sensualists. You can now securely order both the brilliant 1994 album "Lovesongs Of Chaos And Desire" and the band's stellar 1997 album "Dimming The Glitter Of The Stars" via the California-based toneVENDOR online shop. 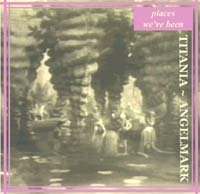 New reviews of both the Titania and Angelmark album are archived in the press section of the site. Several MP3 sample clips are now showcased in the sounds section, with links to where you can sample longer length versions of songs. A new interview with Michael Turner and Mandy Cousins is now online for all to read. Originally published in the Greek music magazine Sense for their September/October issue, the entire interview is now posted online and in English as of today. Visit the Sense homepage to access the interview. Online orders can be placed at toneVENDOR. More outlets, both online and in your neighborhood, coming soon. 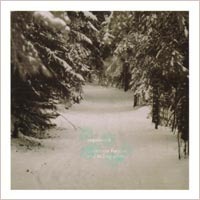 The Minneapolis based independent label Words On Music has offered Titania a spot on "A Houseguest's Wish", the label's tribute CD to the Wire pop gem "Outdoor Miner"! Other artists scheduled to appear include Timonium, Christian Kiefer, Rob Vandeven & Mark Bandola (both ex-Lucy Show), Polar, Fiel Garvie, The Meeting Places, Laura Watling and more. The label is still accepting song submissions though the empty slots are rapidly vanishing, so contact them soon to get involved. Titania and Michael's solo instrumental project Angelmark will be making their official first release via the Greek music zine Sense. The limited edition four song sampler CD will feature two tracks each from both Titania and Angelmark's upcpoming self-titled albums. The tracklist includes "Pan Angelica" and "Pale Sister" by Titania plus "Wave Upon Wave" and "Like Places We've Been" from Angelmark. The disc comes with issue #32 of Sense and was released on September 15th. See the discography page for more details and go to the Sense homepage to order. Michael also re-mastered and re-sequenced the songs from their debut 1992 cassette-only album "Boon" including a superb remix of "Swoon". re-titled "September Wild With Flame", this may get a well deserved CD release at some point soon.